The flow of an electric current down a conducting wire is ultimately due to the movement of electrically charged particles (in most cases, electrons) along the wire. It seems reasonable, therefore, that the force exerted on the wire when it is placed in a magnetic field is simply the resultant of the forces exerted on these moving charges. Let us suppose that this is the case. This formula implies that the magnitude of the magnetic force exerted on a moving charged particle is the product of the particle's charge, its velocity, the magnetic field-strength, and the sine of the angle subtended between the particle's direction of motion and the direction of the magnetic field. The force is directed at right-angles to both the magnetic field and the instantaneous direction of motion. This is called the Lorentz force law, after the Dutch physicist Hendrick Antoon Lorentz, who first formulated it. The electric force on a charged particle is parallel to the local electric field. The magnetic force, however, is perpendicular to both the local magnetic field and the particle's direction of motion. No magnetic force is exerted on a stationary charged particle. according to the Lorentz force law. 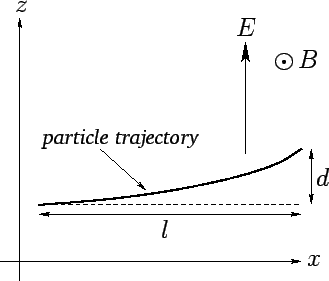 Here, is the particle's acceleration. This equation of motion was verified in a famous experiment carried out by the Cambridge physicist J.J. Thompson in 1897. Thompson was investigating cathode rays, a then mysterious form of radiation emitted by a heated metal element held at a large negative voltage (i.e., a cathode) with respect to another metal element (i.e., an anode) in an evacuated tube. German physicists maintained that cathode rays were a form of electromagnetic radiation, whereas British and French physicists suspected that they were, in reality, a stream of charged particles. Thompson was able to demonstrate that the latter view was correct. In Thompson's experiment, the cathode rays pass though a region of crossed electric and magnetic fields (still in vacuum). The fields are perpendicular to the original trajectory of the rays, and are also mutually perpendicular. Using this method, Thompson inferred that cathode rays are made up of negatively charged particles (the sign of the charge is obvious from the direction of the deflection in the electric field) with a charge to mass ratio of . A decade later, in 1908, the American Robert Millikan performed his famous oil drop experiment in which he discovered that mobile electric charges are quantized in units of C. Assuming that mobile electric charges and the particles which make up cathode rays are one and the same thing, Thompson's and Millikan's experiments imply that the mass of these particles is kg. Of course, this is the mass of an electron (the modern value is kg), and C is the charge of an electron. Thus, cathode rays are, in fact, streams of electrons which are emitted from a heated cathode, and then accelerated because of the large voltage difference between the cathode and anode. where is the angle subtended between the force and the displacement. However, this angle is always for the force exerted by a magnetic field on a charged particle, since the magnetic force is always perpendicular to the particle's instantaneous direction of motion. It follows that a magnetic field is unable to do work on a charged particle. In other words, a charged particle can never gain or lose energy due to interaction with a magnetic field. On the other hand, a charged particle can certainly gain or lose energy due to interaction with an electric field. Thus, magnetic fields are often used in particle accelerators to guide charged particle motion (e.g., in a circle), but the actual acceleration is always performed by electric fields.